I recently had a stunning realization: We’re about to lose one of the most precious resources in America. I’m not talking about oil, gas or rare metals. What we’re about to lose Is the living presence of the elders who make up the Greatest Generation. This amazing group survived World War II and the Great Depression, but unfortunately even they can’t hold back the passage of time. And our world will change when they are no longer with us. This inescapable reality hit me when I saw this chart. A little over a decade ago, there were around six million living WW II veterans; by the end of this decade (with a few hardy exceptions) they will all be gone. Sooner than we think, this unique, inspiring generation will be no more. 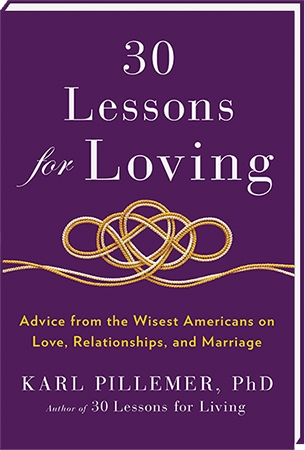 Having spent the past six years gathering the practical advice for living of older people(who in my book 30 Lessons for Living I call “the wisest Americans”), I know that we’re not just losing individuals; we’re losing a way of living and of seeing the world. Why is this generation so special? Part of it is what they’ve been through that most of my peers (the Boomers) haven’t. To a much greater degree than most Americans alive today, they had experiences that pushed them to their ultimate limits: a world at war, an economic downturn that makes ours look mild by comparison, immigration, upheaval, poverty, and deprivation. They also remember a time when communities were stable and closer, when air and water were cleaner, and when people didn’t lock their doors. It’s these experiences that make their advice on how to overcome adversity so meaningful. Monty in this video from our Legacy Project is a great example. America’s elders grew up working. And working hard. And if there weren’t any good jobs available, they took whatever was available and worked hard at it. My first job? Delivery boy. Seventeen bucks a week, that was big money back then. Then I became a tool and die maker’s apprentice in a machine shop on Saturdays. Then I had a friend, her father was a shop steward in a commercial bakery, so I got a big increase. I joined the bakery as a truck driver. That was a dollar fifty an hour. I did that on the weekends, on Saturdays and summers. I had to. I had no money. I used to walk home because I couldn’t afford the subway. Lifetimes of hard work have given the oldest Americans a unique sense of what makes employment happy or miserable. They are experts on how to be persistent when it seems like rewarding work can’t be found, and they know how to take a bad job and make the most of it. Growing up in the Great Depression taught our elders the intense enjoyment that lies in small pleasures. Our needs and desires have become bloated to an extent that it takes an enormous amount to please contemporary Americans. But many of the oldest Americans grew up learning the lesson: Savor the small stuff. Listen to Larry, age 89. Let me tell you, in the 1930s we had the Depression. If you think you got a Depression today, it’s nothing like it was then. People didn’t even have enough to eat back then. A lot of the dads in the neighborhood weren’t working. And we shared simple things because people didn’t have money. We’d maybe get a nickel once in a while. We were half a block from a wonderful park, they had lots of activities there for kids, and wading pools, and we had a huge skating pond down there. And they’d have band concerts down there in the summer the whole neighborhood would go down there.There were popcorn wagons parked all around there. We kids would have a nickel and we’d sit there for several minutes trying to decide “What I should I have?” And these poor guys, they’re trying to wait on you, they’re patient waiting for you to decide: Do you want popcorn or do you want ice cream? You want a Holloway sucker or what do you want? And once in a while at the movies, they would have Saturday matinees for kids, for ten cents. And after the movie if we had another nickel we’d stop at a place that had ice cream and popcorn and we’d get that. And boy, we really had a Saturday afternoon. We should all become aware of just how precious a resource are the remaining members of the Greatest Generation – how rapidly they being depleted. The world will go on – our elders would be the first to assure us of that – but forgive me if I think it will be a less interesting without this remarkable cohort. 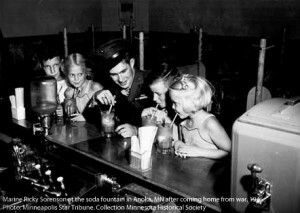 Any thoughts on how we can celebrate the Greatest Generation in their few remaining years? This entry was posted in Aging Well, How To Be Happy, Values To Live By. Bookmark the permalink. Stephen Spielberg’s “Saving Private Ryan” and Stephen Ambrose’s “Citizen Soldiers” are well-deserved recognition of the GIs who landed on Omaha Beach and fought in the Battle of the Bulge. Let us also remember all the others who served. World War II was truly that – a world war – fought in Europe, Africa, Asia and the Atlantic and Pacific Oceans. In the air, on the ground, on and below the sea. Army, Air Corp, Navy, Marines, Merchant Marine and Coast Guard. Anzio, Bataan, Colmar Pocket, Guadalcanal, Hurtgen Forest, Iwo Jima, Midway, Okinawa, Rome, Vosges Mountains … Naming all the battles would exceed the limits of this page. Over the past several years I have had the opportunity of meeting and interviewing scores of World War II combat veterans. I consider each a hero. None agrees with me. “I’m no hero. I just did my job. The heroes are over there under little white crosses.” These men are now in their 80s. Most are grandfathers. Some are great-grandfathers. Virtually all are married fifty-plus years. They are a unique and remarkable generation in American history. As children, their character and shared sense of family sacrifice was wrought in the blast furnace of the Great Depression. On December 7th, 1941 they were eighteen and nineteen year-olds, fully committed to sacrificing their lives and bodies for their family, buddies and country. And they did. By the thousands … tens of thousands … hundreds of thousands. We may never see their type of patriotism again. The Congressional Medal of Honor is our ultimate symbol of heroism. During World War II, 432 brave and gallant men were awarded the Medal. If those men had not been born, or had not served, we would have still been victorious. But without the twelve million men and women in uniform, we would not have won. To me, every GI in harms way or in the line of enemy fire was a hero. They saved the world. Their service, sacrifice and bravery bought and paid for the freedom we enjoy every day of our lives. For this we should be eternally grateful and profoundly indebted. These veterans are in each and every community across this nation. Most are easy to spot. They wear caps with their branch or unit names and designations. Their license plates indicate: Pearl Harbor Survivor – Purple Heart – POW – Combat Infantryman Badge – Air Force Bomber Group and other references to their service. Those that came home went on with their lives. Some carried the physical and emotional scars of war. Their numbers are dwindling all too quickly. More than a thousand leave us each day. Let us show them our respect and gratitude in their twilight years. When you spot a veteran, shake his hand and thank him for his service. It will be an experience neither of you will ever forget. Let us go a little bit out of our way and do them a favor, give them a lift, shovel their walkway. Remember this – when it counted the most, they went to Hell and back for us.